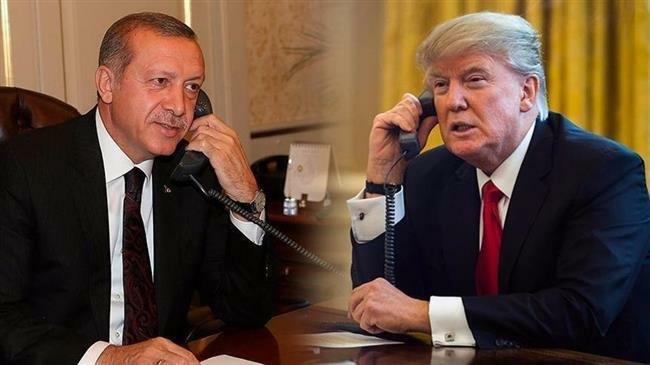 WASHINGTON, Jan. 20 (Xinhua) -- U.S. President Donald Trump spoke over phone with his Turkish counterpart Recep Tayyip Erdogan on Sunday over ongoing tension in Syria and bilateral ties, said the White House. The two leaders "agreed to continue to pursue a negotiated solution for northeast Syria that achieves our respective security concerns," said the White House in a statement. Trump and Erdogan also discussed "their mutual interest in expanding the trade relationship," the statement added. The situation in Syria has been volatile in the past weeks following Washington's decision to withdraw troops from the war-torn country and the deaths of four Americans in a bomb attack which the extremist militia Islamic State claimed responsibility for. Meanwhile, the United States and Turkey have also been quarreling over the Kurdish militia in northern Syria, a U.S. ally in the anti-IS campaign but seen as a terrorist group by Ankara. Washington has reportedly proposed to set up a security zone in northeastern Syria, a move welcomed by Ankara.